Strawberries are low in sugar and calories, and provide a unique combination of essential nutrients, dietary fiber and phytochemicals. Clinical research suggests that eating just one serving of eight strawberries a day may improve heart health, help manage diabetes, support brain health, and reduce the risk of some cancers. One serving of eight strawberries has more vitamin C than an orange, and is packed with beneficial antioxidants and nutrients including potassium, folate and fiber. With year-round availability, our strawberries are a healthy and versatile fruit to enjoy every day. Vitamin C is a water-soluble vitamin with potent antioxidant capabilities essential for many biological functions, most notably ensuring proper wound healing and maintaining cartilage. 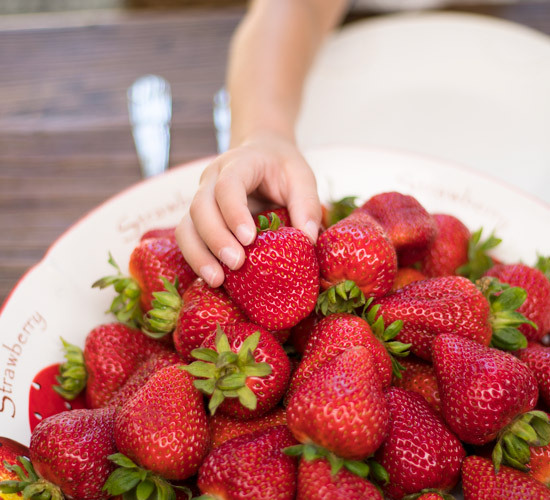 One serving of eight medium strawberries provides 140 percent of the recommended Daily Value. Potassium is an important nutrient to balance electrolytes, aid muscle contractions, and maintain a healthy blood pressure. Diets rich in potassium can lower blood pressure by buffering the effects of sodium on blood pressure. According to the Food and Drug Administration, eating foods rich in potassium and low in sodium may help reduce the risk of high blood pressure and stroke. One serving of strawberries provides five percent of the Daily Value for potassium. Folate is one of the B vitamins found in various foods such as strawberries, oranges, green leafy vegetables and beans. It may prevent some types of birth defects and is especially important for women of childbearing age. Researchers reported that people who eat strawberries have higher average folate intakes than those who reported not eating strawberries. Fiber is considered by the American Heart Association to be important for heart health. Epidemiological studies report that people who eat higher amounts of total fiber have a lower risk of heart disease. Dietary fiber has well-known health benefits such as lowering blood cholesterol and promoting a healthy digestive system. One serving, or eight medium strawberries, provides three grams of fiber, making this fruit a good source of dietary fiber. Antioxidants are key to warding off chronic diseases and promoting optimum health. Research shows that the antioxidants in strawberries are efficiently absorbed within one hour after being eaten. Once absorbed, antioxidants fight free radical compounds that can cause chronic illnesses. In a recent study, strawberries ranked second among the top ten fruits in antioxidant capacity (TAC), which is one reason why they may help prevent cancer and heart disease. In addition to traditional nutrients, strawberries are also rich in phenolic compounds such as flavonoids and ellagic acid, which are the focus of intense study due to their antioxidant, anticancer and antimutagenic properties. Broccoli is commonly regarded as a superfood! This might be because one cup of chopped raw broccoli only has 31 calories, no fat, and 3 grams of protein. Just one cup of broccoli provides over 100% of your daily need for vitamin C and vitamin K, and is also a good source of vitamin A, folate and potassium. 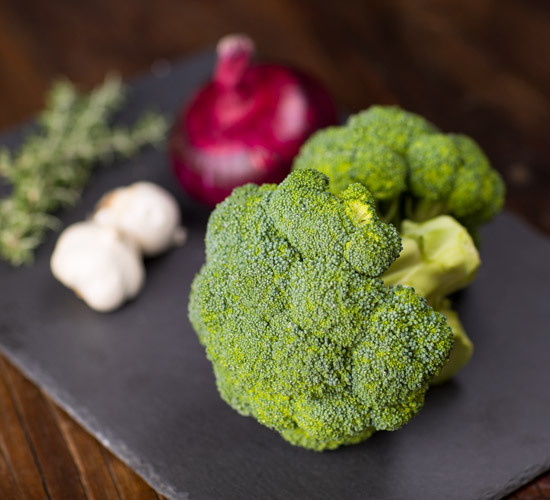 Eating a high amount of cruciferous vegetables such as broccoli has been associated with a lower risk of cancer; namely lung and colon cancer. Studies have suggested that sulforaphane, the sulfur-containing compound that gives cruciferous vegetables their bitter bite, is also what gives them their cancer-fighting power. Researchers have found that sulforaphane can inhibit the enzyme histone deacetylase (HDAC), known to be involved in the progression of cancer cells. The ability to stop HDAC enzymes could make sulforaphane-containing foods a potentially powerful part of cancer treatment in the future. Sulforaphane is now being studied for its ability to delay or impede cancer with promising results shown in melanoma, esophageal, prostate and pancreatic cancers. Another important vitamin that broccoli contains, folate, has been shown to decrease the risk of breast cancer in women. Adequate intake of dietary folate has also shown promise in protecting against colon, stomach, pancreatic and cervical cancers. There is no evidence that folate in supplement form provides the same anti-cancer benefits. The antioxidant vitamin C, when eaten in its natural form (in fresh produce as opposed to supplement form) can help to fight skin damage caused by the sun and pollution, reduce wrinkles and improve overall skin texture. Vitamin C plays a vital role in the formation of collagen, the main support system of the skin. Vitamin A and vitamin E are also crucial for healthy looking skin, both of which broccoli provides.